Melbourne TOS members have been active on a number of fronts during the year. In the aftermath of the devastating Victorian bush fires, they rallied support and collected clothes, blankets and children's toys for those affected. They raised funds for several local animal and social welfare groups as well as making donations to the Golden Link College in the Philippines, the Olcott Memorial School in Adyar and the National TOS projects in India and Pakistan. The Melbourne TS also generously supported these international projects. 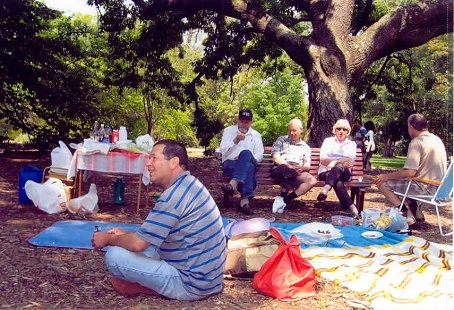 One of the social highlights of the year was their annual picnic in the beautiful Melbourne Botanical Gardens. During the picnic, they held a peace and healing meditation under the trees and raised awareness of the Australian Conservation Foundation which their TOS group supports. Several members have been engaged in innovative service work. Tim Falkner chairs a charity, Know the Odds, that educates school children about the harmful effects of problem gambling. Michael Ryan contributes a lot of time to the Men's Shed Network that provides educational programs, volunteering opportunities and social and recreational activities for older men. Since September 2007, regular sessions on Colour Therapy have been held at the AWWA Community Home for Senior Citizens. Lasting for two hours, each session has been facilitated by TOS member, Gloria Keh. Participants, averaging around 10 per session, comprise both male and female residents of the Home. During the sessions, residents work on specific designs on particular themes, dabbling in colours and working on the concept of a 'circle' format, to promote One-ness, and develop one-pointedness. It is indeed a joy to see residents working in focus on their drawings, whilst having a play with colours. AWWA Home was founded in 1976 to provide sheltered housing for the single elderly. Housed in one of the major suburbs of Singapore, the Home accommodates 136 elderly, whilst providing a friendly environment for self-help and fostering mutual care among its residents. AWWA Home is part of the Asia Women's Welfare Association that's dedicated to provide "a helping hand" to those in need in the community. 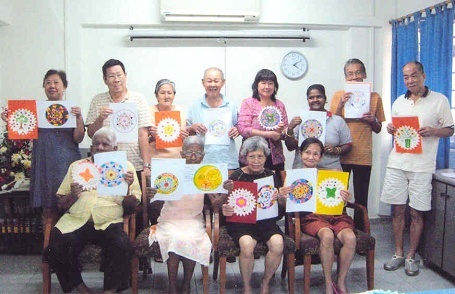 Residents of the AWWA Home in Singapore with their artwork from a colour therapy workshop.